Ratso is an animal which appears to be a cross between a rat and possibly some sort of dog. Ratso is King Koopa's pet; however, he only ever appeared on King Koopa's Kool Kartoons. Ratso appears to be a small dog with bat-like ears, a large orange snout, buck teeth, bulging blue eyes and a pointed tail. 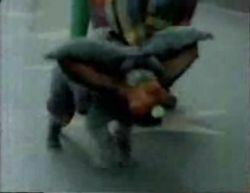 In the show's prerecorded introduction, Ratso is portrayed by an actual dog wearing a costume, as he is shown walking through Hollywood alongside King Koopa and his Troopas. However, during the actual show, Ratso is portrayed by a puppet. During the introduction of the show, Ratso is wearing a leash held by King Koopa, and walks alongside him as he and his Troopas march down the streets towards the studio. After the Troopas are seated, Ratso can quickly be seen sitting between two Troopas, swaying himself from side to side while the Troopas chant "Koopa!". Throughout select segments of the show, Ratso would sometimes appear from behind a curtain to present King Koopa with a prize voucher that he held in his mouth. King Koopa would then read out the prize on the voucher before giving it to a member of the audience. Sometimes the prize would instead be awarded to a home viewer who sent in fan mail. This page was last edited on February 11, 2019, at 18:32.